LANSING — With a small group of large donors driving the numbers upward, three ballot campaigns to change Michigan law have each passed the $1-million mark. Three other campaigns have amassed more than $400,000 in support. On Wednesday, ballot proposal campaigns had to turn in new fundraising disclosures to the Michigan Secretary of State’s Office. Six campaigns have raised much more money than the rest, and the wide majority of the six campaigns are relying on a small number of sources for most of their dollars. The new disclosures cover through Friday, Oct. 20, 2017 — still a year away from the November 2018 election. The most well-funded campaign so far has been Protecting Michigan Taxpayers, which is gathering signatures to repeal the state’s prevailing wage, which sets wage standards for certain public construction projects. The campaign has collected $1.3 million in support with $1.1 million coming from the Associated Builders and Contractors. The Construction Legal Rights Foundation has chipped in $75,000. The California-based Silver Bullet Group gave $50,000. And the Wyoming-based September Group gave $50,000. The campaign needs 252,523 valid signatures to put its initiative before lawmakers. The campaign has spent most of its money, $1.0 million, on signature gathering, according to the campaign finance disclosures. An opposition group, Protect Michigan Jobs, has collected about $240,460 in support this year. — including both in-kind contributions of services or goods and monetary contributions. The Michigan chapter of the National Electrical Contractors Association has provided $73,148 of the total. 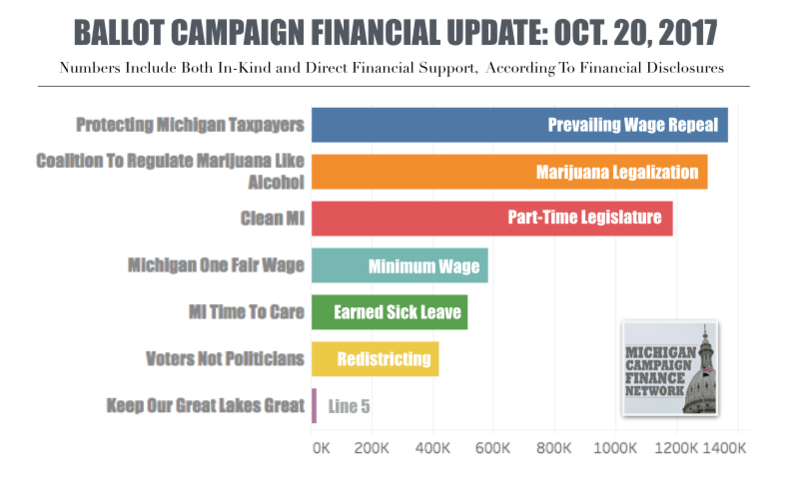 The second most active ballot campaign in fundraising has been the Coalition to Regulate Marijuana Like Alcohol, which wants to legalize marijuana in Michigan. The committee has now collected $1.3 million in support since it formed in 2016. It’s received $342,794 in support from nonprofits connected to the national Marijuana Policy Project and $250,000 from Smokers Outlet. The campaign also received $170,000 from another ballot committee, MI Legalize 2018. So far, the Coalition to Regulate Marijuana Like Alcohol has spent about $782,828 on signature gathering. That total includes both direct spending and in-kind contributions of signature gathering services. The campaign to initiate a new law needs 252,523 valid signatures. An opposition group, the Committee to Keep Pot Out of Neighborhoods and Schools, didn’t report any contributions on its new disclosure. It’s raised only $5,000 since it formed in May. Clean MI, the campaign to amend the Michigan Constitution to require a part-time Legislature, has also crossed the $1-million fundraising mark. The committee, which has been championed by Lt. Gov. Brian Calley, has now collected $1.1 million in financial support. It’s biggest supporter has been a nonprofit that doesn’t disclose its contributors, the Fund for Michigan Jobs. The nonprofit has given $666,000 to the committee. A PAC connected to Calley, MIPAC, has provided $301,224 in support. Hazel Park-based Capital Sales Company has given $100,000. And businessman William Parfet, of Hickory Corners, has given $100,000. The committee has reported spending about $202,238 on signature gathering so far, according to its disclosures. Because it aims to amend the constitution, it needs to collect 315,654 valid signatures. An opposition committee, Citizens Protecting Michigan’s Constitution, received $35,000 from a Michigan Chamber of Commerce PAC on Oct. 12. That same day, the committee reported spending $30,000 on digital media opposing a part-time Legislature. Voters Not Politicians, the campaign to institute an independent redistricting commission to draw legislative district lines, hasn’t raised as much money as the other committees but has had a much broader donor base. The committee has collected $419,902 in support through more than 5,500 individual contributions. Voters Not Politicians is relying on volunteers to collect signatures. It also needs 315,654 valid signatures because it aims to amend the Constitution. Its biggest contributions have come in the form of legal services provided to the campaign as in-kind contributions. Lawyer Fred Green, of Royal Oak, has provided $30,000 in in-kind legal services, and lawyer Scott Reynolds, of Douglas, has provided $20,400 in in-kind legal services. Voters Not Politicians’ spending on legal services or contributions of legal services have amounted to $124,066. Many expect the ballot proposal to eventually face a legal challenge. An opposition group, Committee to Protect Voters Rights, formed on Oct. 12. It reported no contributions before the Oct. 20 disclosure deadline. Two other ballot committees that share some financial supporters have also been active raising money. The Michigan One Fair Wage campaign wants to increase the state’s minimum wage to $12 an hour. The state’s current minimum wage in $8.90. The campaign has received $583,222 in support with $297,648 coming from another ballot committee, Raise Michigan. Raise Michigan has gotten $250,000 from the United Auto Workers CAP Council this year. Michigan One Fair Wage has also received $125,000 from the Restaurant Opportunities Center and $75,000 from the Economic Justice Alliance of Michigan. MI Time To Care, which would require businesses to provide earned sick leave for workers, has received $514,319 in support this year. It’s received $50,109 from the Economic Justice Alliance of Michigan and $60,400 from Raise Michigan. It’s also received $200,000 from the Sixteen Thirty Fund, of Washington D.C.
MI Time To Care has already spent $191,891 on signature gathering.